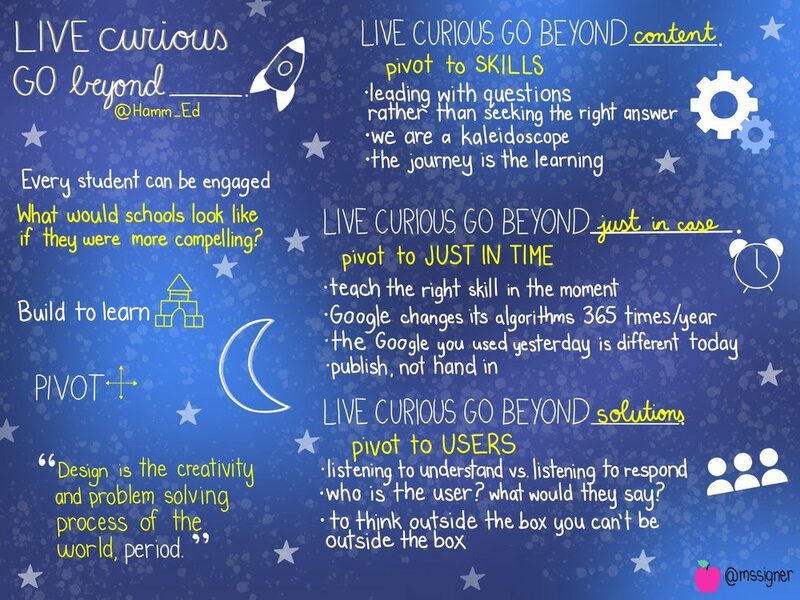 Brian believes that every student can be engaged in an educational experience that compels them to 'Live Curiously and Go beyond' as they discover their own “Moonshots”. Over the past ten years he has circumnavigated the globe numerous times in the pursuit of this endeavor. In this Keynote Brian explores Design Thinking and educational prototypes which compel students to engage with passion. Keynote: Why DEsign for edu? Do you ask your students to be creative? To be problem-solvers? Connect with communities in an authentic manner? 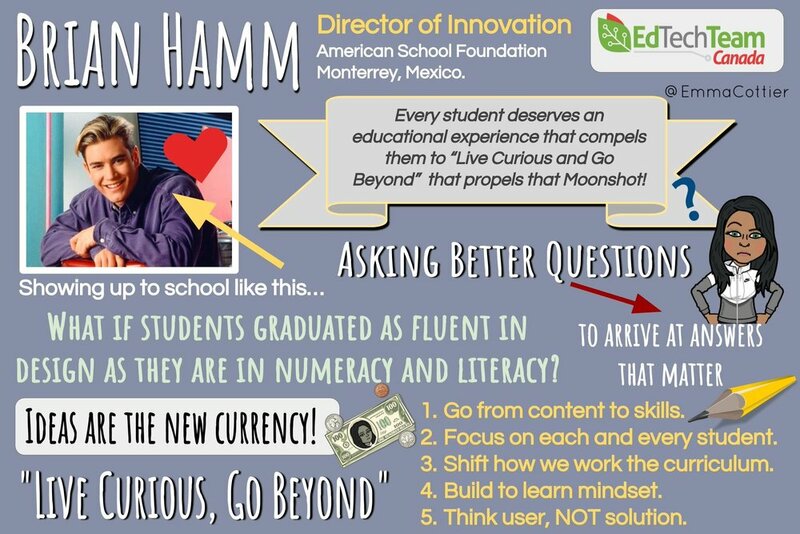 If yes, “What is your process?” Brian Hamm has spent the last 5 years asking these questions of students, faculty, and leadership from around the globe and 95% of the time they respond with the “Problem Solving Approach”. Mainly, identify a problem, research, brainstorm, develop a solution, test is out. Now this is a process, the only problem is it is “me” focused, not “we” focused or “user” focused. Design is the creative and problem solving process of the world, period. Every product we touch, and most experiences we engage in, have gone through the Design Process. 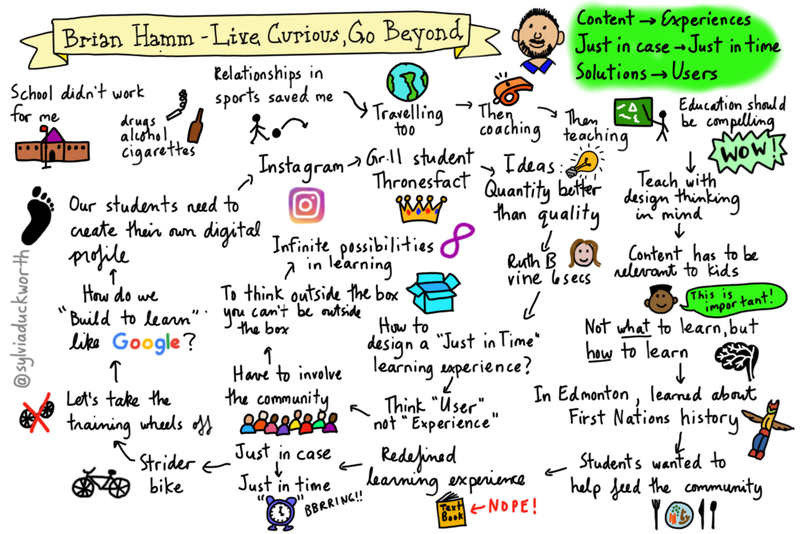 In his Keynote presentation, “Why Design for Edu” Brian will share his experiences with and without design and leave participants with some practical applications to start redesigning the learning experience for their students tomorrow. The truth is we are all designers, you're just good, bad or indifferent, start being better now. Lev Vygotsky’s research concluded that “Learning is Social”. Numerous studies have continued to confirm the Social Learning theory and that the a positive teacher-student relationship has the largest impact on learning and achievement, aka John Hattie. The question is, how do disruptive technologies impacted this paradigm and these relationships? In his keynote, “Blended Learning is ALSO Social”, Brian presents the perspective that technologies, when used appropriately and with purpose, are amazing and enhance the connections educators have with students. The great part is that most educators are already leveraging many of these amazing tools and don’t even know it. What educators do every day is amazing. The technology we have at our fingertips is amazing. Join Brian and discuss how you can leverage the necessary tools to leverage technology in amazing ways to form stronger communities for learning.